Travels of William Bartram is the familiar title by which the 522-page volume by naturalist William Bartram (1739-1823) is generally referred. The work documents his four-year journey through large portions of the Southeast, much of which he and his naturalist father John Bartram had visited during William's youth, sometimes making their headquarters with relatives in Bladen County. Published by subscription in Philadelphia in 1791, Bartram's account was officially titled Travels through North & South Carolina, Georgia, East & West Florida, the Cherokee Country, the Extensive Territories of the Muscogulgles, or Creek Confederacy, and the Country of the Chactaws; Containing an Account of the Soil and Natural Productions of Those Regions, together with Observations on the Manners of the Indians. Bartram made a very careful study of plants and animals, discovering new species in some cases and treating all with a reverence and awe stemming from his Quaker upbringing, which taught him that God's creations were perfect and right. He also recorded the customs and history of the Seminole, Cherokee, and Creek Indian Nations, becoming one of the earliest white authorities on these peoples. Though Bartram's interests as a naturalist were broad, his descriptions of alligators are particularly memorable. His accounts of a female alligator's care of her eggs and young and of the struggle to the death of two very large alligators illustrate both his observational skills and his exceptional literary talent. Having received a classical education at the Philadelphia Academy, Bartram became a careful author and artist; his skill enabled him to record his observations with both words and brush. His Travels is an early example of the style of nature writing that combined scientific observation and documentation with anecdotes and personal impressions of the natural world and its inhabitants. Bartram received both criticism and praise for his brilliant combination of scientific and religious ideas and for employing not only a scientific vocabulary but also lyrical description and everyday language to communicate his observations. His work had an immense impact in the scientific community as well as among philosophers, writers, and the general public in America and abroad. In fact, Romantic poets William Wordsworth and Samuel Taylor Coleridge drew from his descriptions, while naturalist writer Henry David Thoreau was influenced by his merging of science and poetry in unabashed admiration of the natural world. Bartram himself became an adviser to younger naturalists of his own day as well as an advocate of a distinctively American scientific identity. Contemporary ecologists and historians still refer to his Travels for its meticulous descriptions of nature and Indian society. Brad Sanders, Guide to William Bartram's Travels: Following the Trail of America's First Great Naturalist (2002). "The Travels of William Bartram." The Bartram Trail Conference. 2012. http://www.bartramtrail.org/ (accessed August 17, 2012). Cashin, Edward J. "William Bartram in Georgia." 2010. The New Georgia Encyclopedia. http://www.georgiaencyclopedia.org/nge/Article.jsp?id=h-2179 (accessed August 17, 2012). Hallock, Thomas. "William Bartram." The Encyclopedia of Alabama. 2007. http://encyclopediaofalabama.org/face/Article.jsp?id=h-1141 (accessed August 17, 2012). "Florida Naturalists: William Bartram." Florida Museum of Natural History. http://www.flmnh.ufl.edu/naturalists/bartramw01.htm (accessed August 17, 2012). Harper, Francis, ed. The Travels of William Bartram: Naturalist Editions. Athens: University of Georgia Press, 1998. Slaughter, Thomas P. ed. 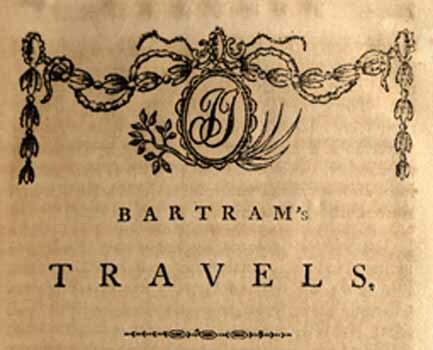 William Bartram: Travels and Other Writings. New York: Library of America, 1996. Illustration from page one of the 1791 edition of Bartram's book. Image from Documenting the American South, UNC-CH. http://docsouth.unc.edu/nc/bartram/ill2.html (accessed August 17, 2012).